Bread staling is mainly related to starch retrogradation, which hardens the loaf resulting in a significant decrease of consumer acceptance and in great economic losses. The inclusion of enzymes in bread formulation, such as lipase and amylase, or the use of sourdough, can reduce bread staling and therefore extend shelf life. Besides, the shelf life of bread can be decisively influenced by packaging. The packaging procedures applied by baking industries mostly use modified atmosphere and multilayer plastic films specifically designed to retain the gases. The combination of opportune formulations and appropriate packaging selection can extend bread shelf life up to 60 days. Fig. 1. 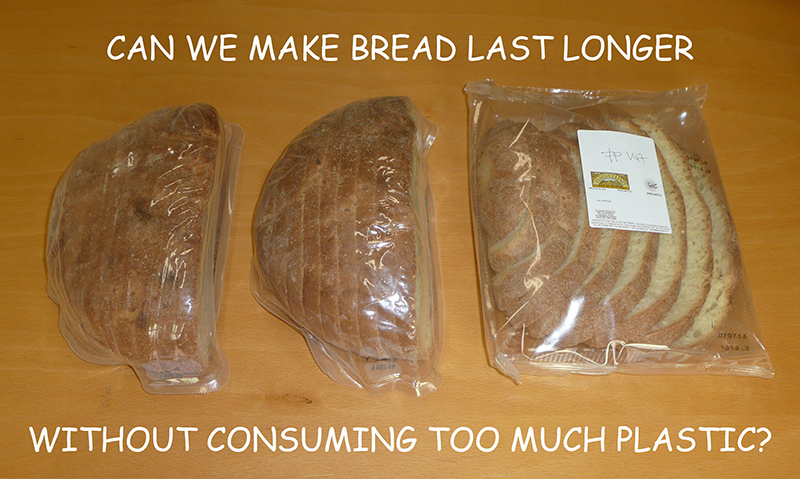 Comparison of different types of bread packaging. TF1: a commonly used two-piece thermoformed packaging, quite thick; TF2: a two-piece thermoformed packaging at reduced thickness; FP: a flow-packaging system based on a very thin plastic material. Packaging systems are selected based on their effectiveness, i.e. ability to maintain quality characteristics, but also efficiency, i.e. ability to contain environmental impact and costs generated by packaging production and disposal. It is important to reduce the thickness of materials used in packaging, without compromising the standard shelf life. Thermoformed packaging and flow-packaging can be both applied to bread. Flow-packaging has the advantage of high working speed and can allow saving of packaging material because usually requires relatively thin films. Thermoformed packages are composed of a thermoformed bottom and a lid, where the bottom is usually thicker than the lid. With the aim of reducing plastic consumption, we compared the effect of three packaging systems on bread shelf life, by monitoring bread characteristics during 90 days of storage. In particular, we considered: i) one commonly used two-piece thermoformed packaging, relatively thick (TF1); ii) a two-piece thermoformed packaging at reduced thickness (TF2); iii) a flow-packaging system based on a very thin material (FP) (Fig. 1). All packages included sprayed ethanol, so as to contrast molding, and modified atmosphere, composed of 30% CO2 and 70% N2. Our study proved that reducing thickness of the thermoformed system did not compromise bread standard shelf life (60 days). However, flow-pack system had a lower performance in retaining bread quality during storage. Indeed, the modified atmosphere composition of TF1 and TF2 packages after 60 and 90 days was not significantly different in terms of level of oxygen, usually involved in degradation reactions, whereas the oxygen level markedly increased in FP. Besides, one of the objectives of bread packaging is to limit water loss. TF1 retained crumb moisture better than FP, without significant difference with TF2 from 60 days onwards. Also crumb firming, commonly associated with bread ageing, was faster in FP than in TF1 and TF2. Also volatile compounds, responsible of bread aroma, changed during storage. Furans, arising from thermal reactions occurring during baking such as Maillard reaction, and characteristic of crust aroma, decreased more markedly in FP than in TF1 and TF2. The statistical analysis of the whole dataset pointed out that the most significant influence of packaging system on bread characteristics occurred in the initial phase of storage, when the conventional system TF1 showed the best performance, allowing only very slight changes compared to the fresh product. However, storage times longer than 15 days, which correspond to the period when the majority of product is generally purchased, tended to smooth the differences induced by packaging. Both TF2 – thermoformed package with lower thickness – and FP could be valid alternatives to TF1: while the former would not jeopardize the standard shelf life of 60 days, the latter could be adopted when the expected product turnover is within 30 days. The choice of TF2 or FP systems would carry a significant reduction of plastic consumption which, in turn, results in environmental and economic improvements. Shelf life assessment of industrial durum wheat bread as a function of packaging system.